Welcome to the Pack 40 Website! Welcome to our site of Cub Scout Pack 40. Our pack operates mainly in Myers Corners Elementary School within the Wappingers Schools district in Wappingers Falls, New York. Here you'll find the latest activities, pictures and news about our group. Visit us regularly to see what we're up to. Our regular pack meeting is on Fridays as shown in the calendar page. Please read our "monthly" Cub-o-Gram, just click through the Cub-o-Grams tab on the left of this page. Pack 40 is proud to announce that we have earned the 2017 Journey to Excellence Gold Award for meeting the BSA goals and showing that we have a quality scouting program. More information about Journey to Excellence can be found at http://www.scouting.org/jte.aspx . Please feel free to stop by one of our pack meetings and check us out. Support Pack 40 By Donating Bottles and Cans! Want to help support Pack 40? Tired of feeding bottles and cans into the machine at the grocery store to get a few nickles? Donate them to us! We have set up an account at A&A Redemption Center in Wappingers Falls. 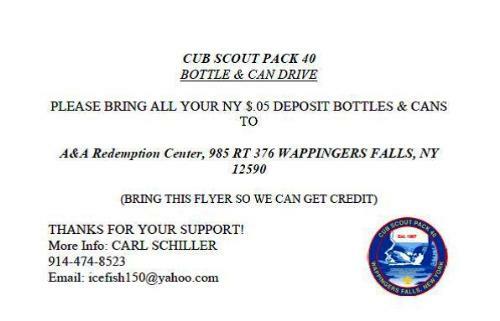 All you need to do is bring your rinsed redeemable bottles and cans (from any store or brand, as long as it has NY $.05 on it) to the redemption center and tell them it is for Cub Scout Pack 40. They will send us a check whenever the monthly account reaches $50. What could be easier? A&A is located at 985 Route 376 (Brookmeade Plaza, near McDonalds). Print the attached flyer and bring a copy with you to ensure the donation goes to the right group. Please share this with family and friends!